Wah I don’t want to grow up! Its my birthday this wednesday as well :) Happy Birthday to you. lol i thought you were a Hawaiian. happy birthday. Happy Birthday man! Hope it’s a good one. Nice Reed Richards side burns. Not so sure about the Rogue bangs, though. Haha, my birthday as well. Happy b-day man! It’s my b-day Friday, so it’s doubles this week! …You know, with your coloring…you kinda look like Lar DeSouza. happy birthday to you, Hawk. Hope you have a great one. Actually, you look like Nick Fury. Classic version, not BMF version. Get an eye-patch, go for the Nick Fury look. Same here. Best birthday ever. Is it just me, or does that pic really make Hawk look like Auron from Final Fantasy 10??? Dude, I think you’ve got lice in your beard. More like Ghoul only, don’t you think? happy birthday man. the gray looks good on you. you look like dr. strange. A little “Just For Men” will take care of most of that. Trust me, I know. You’re only as old as you feel. I turned 33 last month and I feel 10 years younger. I may not look the part but at least I’m happy. Cheer up. No matter how old you get, you will NEVER be as old as the Universe itself. Unless you count how far back your matter dates, in which case you are REALLY old. But you’d have to be a nerd to care about that. Age of mind:Same as your shoe size, MUAHAHAHA!!! Your never too old to think young. That a coat on the wall behind you, or are you rockin the mullet? Happy birthday. Best of wishes for the year to come. 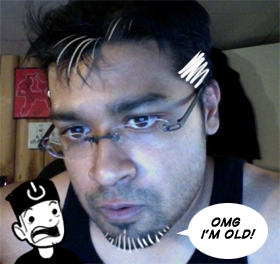 And that mock up makes you kinda look like Lar from Least I Could Do, but with less beard. Happy birthday. One of many more, hopefully. Best wishes. Happy Birthday from Mexico Hawk!! You’re only as old as the woman you feel ;) :P (and if that doesn’t get me accused of being a pervert, probably nothing will). My GOODNESS! You HAVE HAIR!!! Sorry…I…I just seem to only see you with a headband on. How on earth can you say your aging anyway when you ACTUALLY don’t even have a bald spot?! You’ll know you hit the mark when you have to join the hair club for men. Maybe you’re not old. Maybe your hair is turning white because who have experienced great fear. Maybe, just maybe, you’ve been taken over by Parallax the yellow embodiment of fear. You should go to your local guardian of the universe and checked out, my man. Heya. Sorry I missed the appointment. Was busy waxing ye oldie scythe. Don’t worry though. I’ll be in town next week. Hey Death, you don’t wax a scyth, you take it to a wetstone, and I know for a fact you are not the god of death. That title is specificaly held by Abyss, who I am a minion of and therefore reside in limbo with along with Oblivion, Tearahk, and the other reapers. No wait, are you that reaper who sits in the corner all day, dude your really creeping everyone out, that and you havn’t finished a mssion in what, 10 weeks. C’mon man, were trying to run a legitamit business here, we can’t have people slacking off. Although if you really want to be the one to get Hawk I think we can change your schedule around a bit, although it may take a couple years for the paperwork to get through, undead work really slow. Anyways, happy birthday Hawk, and those white lines make you look like Mr.Fantastic. You are old? I have no sympathy for you. I am 33!